PersonaWorld continues to upload lab work for JoJo's Bizarre Adventure All-Star Battle. Watch Wham combos inside. PersonaWorld proceeds with the Bizarre Adventure. A new combo video has surfaced from the popular King of Fighters XIII uploader. 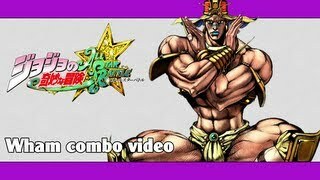 Lately, PersonaWorld has been diving into JoJo's Bizarre Adventure All-Star Battle. The latest post puts Wham on display.